In my last post I wrote about Whitehack's setting, the White Curse. We're now nearing the end of the book and I want to wrap up some odds and ends and give you a summary of the whole Let's Study series. So, there is a page with a paper d20. It's reminding me of old D&D games where a twenty-sided die was not included. It's a two-pages spread with numbers and you can spin a pencil and point. The next page is about troubleshooting. This is a great idea and I wish that other designers would include this in their books. There are entries like "The characters have too much or too little gold." or "It is hard to agree on things." Finally, we have a page with terminology and an index. Both are pretty useful if you want to look up things quickly. The book concludes with the OGL (Open Gaming Licence). The game is based on Swords & Wizardry Whitebox (which is also available under the OGL) and all mechanics as well as Marv Breig's previous work are open game content. Everything else, including the names Whitehack and White Curse (...) is Product Identity. As far as I understand the legalese you can create your own work based on Whitehack's mechanics and distribute/publish them. I like open licences if just for the fact that fans can come up with their own stuff and can share them without having to fear problems. I wholeheartedly agree, Whitehack looks fantastic despite having NO artwork. I found a video review on youtube which shows how the book looks like. Unfortunately, there is no electronic version of this game. That's by author's choice and likely won't change. I find that regrettable because PDFs have certain advantages (cheaper, searchable, easier to buy, more comfortable for online gaming etc.) and print on demand by lulu is a tad expensive because of shipping costs. A digital edition of the game would make it much easier to distribute the game. The official site has some resources available, namely characters sheets in English, German and French and an errata. My own blog has a cheat sheet and a modified adventure made by me as well as some character creation help docs by other members of the G+ Whitehack community. Whitehack is a brilliant neo OSR game. 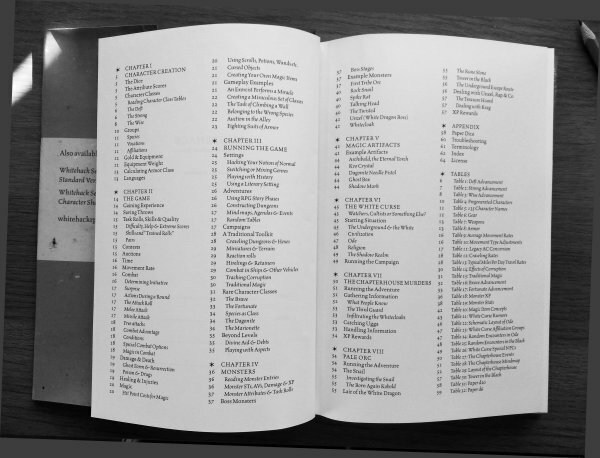 It manages to cram lots of good material into only 64 pages. As the author promises it is a complete game. Whitehack doesn't try to replicate the original but puts its own twist on a classic game. It manages the balancing act between old school heritage and more modern ideas. It's clearly influenced by the 00's movement. If you don't like that it probably won't be a good fit for you. Because of its roots there are still some oddities like the mortality rate of low-level characters. This is slightly offset by some clever rules changes like Playing in Ghost Form and Save vs Damage. The mechanics are pretty smart and the inclusion of Auctions gives the Referee an enhanced resolution mechanic for situations other than combat (instead of using a single task roll). Still, it can be very abstract which is off-putting for some folks. The good thing is that you can skip this rule and it won't break the game. The freeform nature of descriptively defining the game world and the character vocations offers players lots of opportunities to come up with unique character concepts and allows the Referee to customize the game world to her liking. The open nature of how magic works can make it or break it for you. While I absolutely love the freedom that I have, others might find the lack of "hard rules" disconcerting. The 2nd edition mitigates this somewhat by giving you guidelines for using traditional magic but still some negotiating and rulings by the Referee are involved. The writing style is very terse, so it's easy to overlook things on your first pass. However, the text is inspiring and the White curse setting very evocative. For me, Whitehack is truly a gem in my old school collection and an improvement over the very good 1st edition of the game. 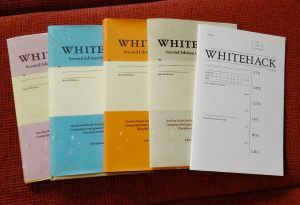 Whitehack is in many ways old-fashioned and still in some ways it is modern and takes a fresh look at traditional rules. I'm pretty sure that this isn't a game for everyone (but what is?) but I strongly encourage you to take a look if you like the OSR and want to experience something unique. I for one put Whitehack as one of my top 3 old school games. In fact, I find it hard to write about it with an objective distance because I like the game so much. useful advice for the Referee - tables with monsters, magic artifacts etc.